Llandudno is a seaside holiday resort nestled between the Great Orme and Little Orme on the North Wales coast. The town is known as the Queen of the Welsh resorts with a residency of over 20,000. The town's history goes back over 4,000 years (although not the members of the Lions Club!). This years, 2019,sees our club reach 42 years old. Our Charter dinner was held on 23rd February in the St George's Hotel Llandudno. This is one of the town's premier hotels and it was a fitting venue for our birthday celebration. See our sites News Page for more inforation. 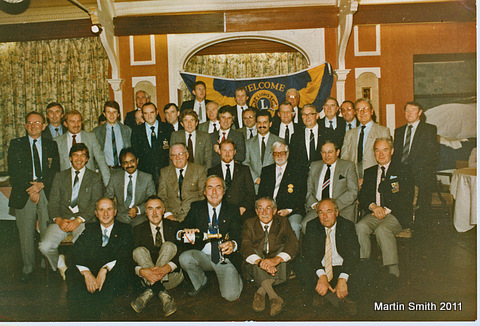 Back in the '70s these where the guys who got together to form The Lions Club of Llandudno. We are 42 and still going strong. Some of the faces are still the same, there are some new ones and sadly there are some who are no longer with us. If you have any comments about the site of the club, please get in touch, a list of contacts are on the Contacts page.